It seems like it was only a few days ago that we still had snow on the ground here in Western Pennsylvania. The summer has slipped by us and the time is getting closer to climb up a tree to wait for the majestic whitetail. 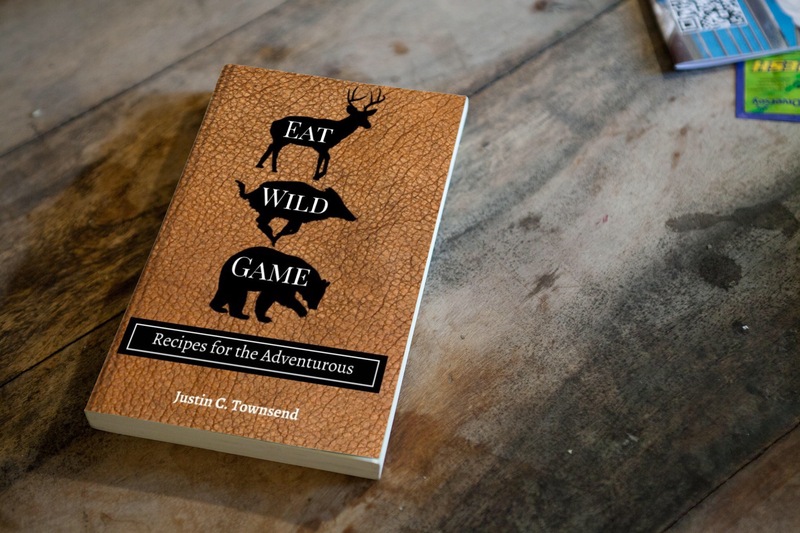 I’ve shot in several 3D archery shoots this summer and hope to make it to at least one more, but there are a few other skills I like to focus on while practicing in my backyard to help me be as prepared as possible when I take to the woods. Deer are crepuscular and are most active just after dawn and just before dark. When a deer steps out in the waning light at the end of the day I want to make sure I am prepared to take the shot when lighting isn’t the most optimal. In order to be ready, I practice shooting in low light conditions to make sure I can clearly see through my peep sight and can pick a spot on the target. When I’m hunting, I set a limit to the distance I’m willing to take a shot, my limits may be conservative by some standards, but the distance is within my comfort zone and allows me to be more efficient and deadly with the shots that I do take. While practicing, I make sure to regularly shoot from a distance that is well beyond what I would take while hunting. When I practice at longer distances, it makes the close shots feel even closer. Deer are quiet, it’s amazing how a 150 pound animal can walk through the dry leaves completely silent. I have been surprised by the presence of a deer that was already within shooting range many times. When this happens, it is nearly impossible to grab the bow, stand, draw, and take a shot without getting busted. Often, a shot from a seated position is necessary. But, if not practiced, it can be very difficult. If draw weight is set too high or the skill not practiced, it will be next to impossible to draw the bow without making any unnecessary movement. 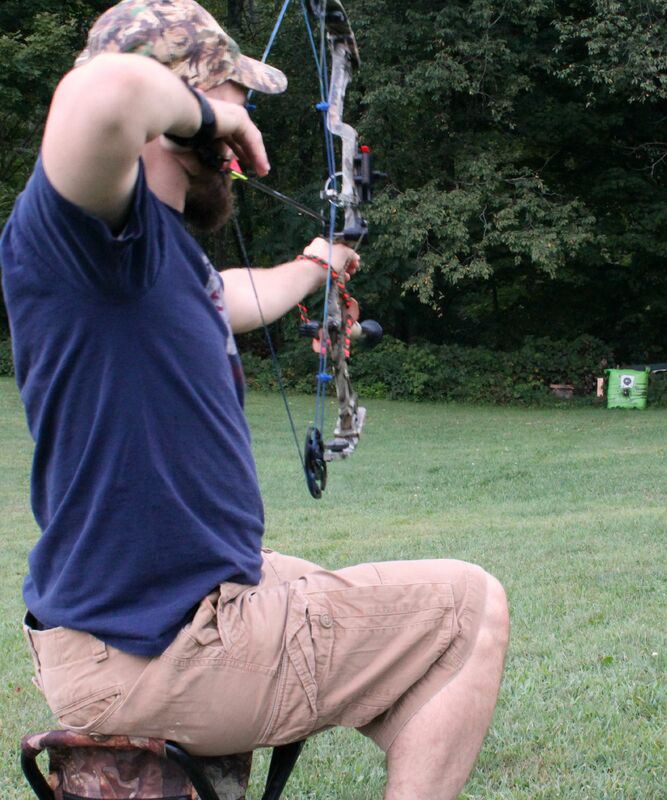 If it’s difficult to draw back the bow, lower the draw weight and keep practicing. Everything feels a little different while shooting from a seated position, so make sure to prepare for this scenario before venturing into the woods this fall. When I normally practice in the backyard or shoot at a 3D course, I’m using field points and normal nocks. But, when I’m out hunting I have broadheads and lighted nocks on my arrows. 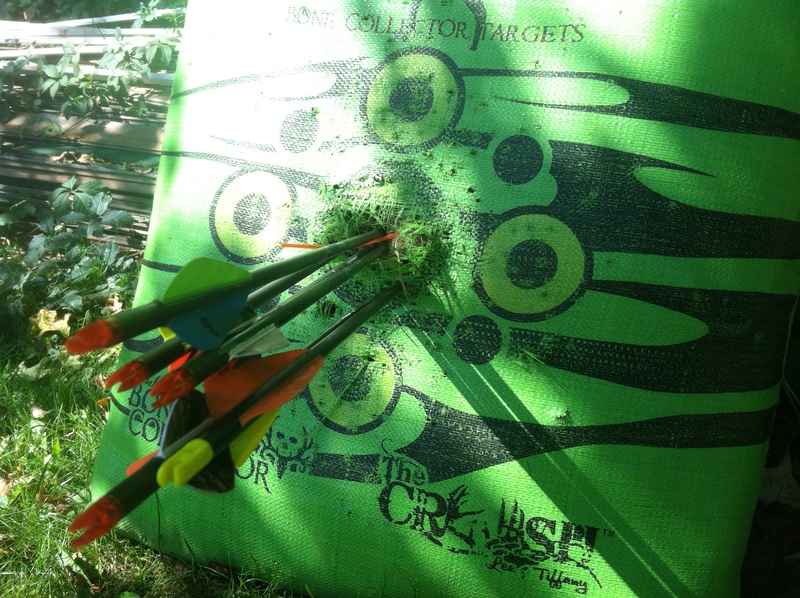 So, the weight of the arrow varies slightly from my target set-up. It’s very important to practice with the exact hunting set-up that you intend to use. The sight may need to be adjusted, or the arrow could fly awkwardly with the broadheads attached, which may require paper tuning. Take advantage of the practice tip that comes with the broadheads and make sure you are able to hit where you are aiming, consistently. All through the summer I shoot while just wearing a T-shirt, but when it comes time to sit in the stand, it will be much cooler out and I will be layered up to stay warm. To make sure there isn’t an issue I like to take a few shots in what I would wear into the woods, from base layer to gloves. It is very important to practice with gloves on if you intend to hunt with them. When I first practiced while wearing gloves I found that I had a hard time getting the feel I like on the trigger of my release, so I took a very tight fitting glove, it’s actually a liner for work gloves, and cut off the trigger finger which helps me get a better feel when I’m at full draw. Once season starts, I’m guilty of neglecting to continue practicing, which is equally as important as practicing during the pre-season. Why put all the hours of shooting in before season just to stop once season starts. Not only will this help maintain shooting form, it will also help ensure that if equipment is bumped off or comes loose during the hike in or out of the woods it will be corrected before taking aim at an animal. 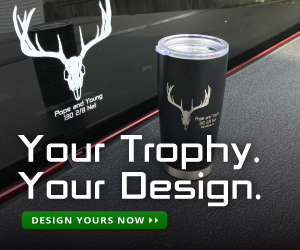 When archery hunting, inches matter and it’s important to make sure you are prepared as much as possible. Practicing in these areas will help get you there, so when that buck walks in front of you, you will have the skill and confidence necessary to be successful and fill the freezer.